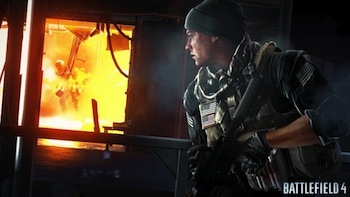 Battlefield 4 may become a full-body experience with Kinect "peek and lean" motions. Battlefield 4 may be getting second-screen and Kinect support, according to DICE executive producer Patrick Bach. Speaking with Xbox Wire, Bach revealed that DICE is experimenting with expanded the Xbox toolset, namely Xbox Smartglass and Kinect. "Through SmartGlass, Xbox players will be able to view the overhead map during multiplayer matches and take advantage of the second screen," says Bach. "Also, with Kinect, we're looking into features that enhance the controls including peeking and leaning and tracking head movement as well as incorporating voice commands." At the moment, DICE isn't willing to confirm that either feature will be definitely be included in either the Xbox 360 or Xbox One versions of BF4. Given the specific applications described, however, both modes seem like very possibilities. Battlefield 4 comes to Xbox 360, PS3 and PC October 29, and will be available at launch for both PS4 and Xbox One.